My son has been fascinated by Legos as long as I can remember, and as he has moved into his teens, his interest has moved on to the Lego Mindstorms product. Given the potential of Lego as a brand and the Mindstorm NXT, I am mystified that Lego just doesn't get it when it comes to creating a strong brand as children get older, especially in the US market. There is prime opportunity to create brand awareness and loyalty through some very simple things that many other companies do, such as branded apparel and accessories, as young boys grow into their teens. The strongest brands create incremental sales and passive marketing through apparel and accessory sales. One of our summer trips was to Chicago, Illinois, USA – home to a Lego company store. My son wanted to visit the store all summer, only to be greatly disappointed by the total lack of anything that he could buy that showed his affection for Lego. No t-shirts, no baseball caps, nothing. Unless you were an 8-year-old, and maybe there would be something in your size, but one couldn't count on it. And with the Mindstorm, they still don't get it. I just discovered that the Bluetooth won't work with their release software on an Intel-based Macintosh running Rosetta. Hello! The Intel Macs have been available for over a year before the NXT was released. I was looking forward to the freedom from the USB cable. Overall, Lego isn't creating a positive end-user experience on-line, in-store or with their product. I foresee more plant closings. Compare this to Limited Too. My daughter has become semi-obsessed with visiting this store, which isn't so bad, even for a dad. Granted that there were only two fathers and a half-dozen soccer moms in the store while we were there. This is a great store for pre-teen and tween girls, with none of the objectionable fashions that are featured at other retailers. It's a very positive, pro-girl environment, emphasizing cute and stylish clothes and accessories that really appealed to my daughter (and to the parents – we prefer to guide our daughter in modest dressing, not the ho style). I noticed that the in-store music was all female performers. They've created a great experience. My daughter can't wait to go back to the store. My son on the other hand, won't want to return to the Lego store. Of course it's all part of growing up. But clearly one manufacturer doesn't understand about creating consumers for life, and the other: it will only be a matter of time before my daughter wants to visit the Limited. Time and a few more inches. Amazingly enough, many of the topics we touch on in Design Matters have been written about by more informed and enlightened individuals. These individuals are so knowledgeable, they have actually written books (instead of simply writing blogs), indicating that someone, somewhere, has deemed their writing as worthy of the expenditure of ink, paper and other resources. Not that some blogs aren't worthy of becoming books. Hmmm. Will the blogosphere someday replace books? Either way, we appreciate the efforts of everyone who writes. Anyway, I digress. Please visit the Altered Ego + Design Matters bookstore, and support capitalism, free speech and the creative economy. Given that we all have the same 26 characters in the alphabet and the same visual shape vocabulary to work with, it's not unusual to find instances of logos that are similar, and at times identical. "Consider it instead a little public service reminder for designers: you’re being paid as much for the quality of your thought as for the actual Illustrator file (or whatever) that you send along at the end of a project. Document your thinking well and present it clearly. You’ll look smarter and you’ll find your ideas are easier to sell." So the key here is: While our visual vocabulary is similar, thinking different is the key to creating a memorable and compelling identity, yet alone a unique one. So where does a tech-savvy midwestern designer go every September? To the engine show, of course. After all, this is farm country. Much like a county fair (where all the exhibitors and vendors set up in exactly the same place year after year), it's a combination swap meet and collector's exhibit. 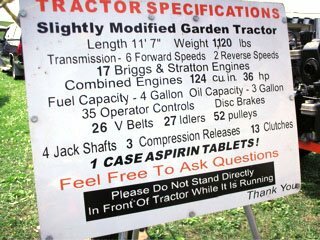 Far removed from the technology-obsessed cities across the country, this show features 20th century tech in the form of hit-and-miss engines, tractors (vintage of course) and all the John Deere paraphernalia you want at reasonable prices. 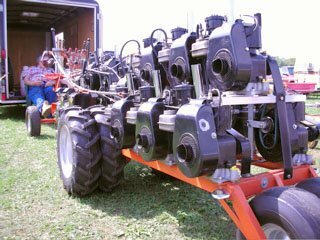 My favorite: the "slightly modified garden tractor," with 16 engines. Top that, Jesse James or Orange County Choppers. Designed to impress to say the least. Well, if you're into that sort of thing. It's time to gather some co-workers and snipe some posters in the corporate offices. Despair.com continues to inspire with its witty and incisive parodies of motivational posters and propaganda,* I mean paraphernalia. John Maxwell's leadership seminars, Maximum Impact, most recently the 360° series, referred to the work of despair.com as a way to instill leadership principles and to motivate those attending. Ignorance It's amazing how much easier it is for a team to work together when no one has any idea where they're going. Get To Work You aren't being paid to believe in the power of your dreams. If you don't find these hilarious, you must be a manager or executive. Lighten up! It seems that many of my friends and close associates have corporate jobs, and that even the seemingly most enlightened organizations, despite their best efforts, maintain the chasm between management thinking and personnel who execute the projects. Let's be honest: No matter where you are in an organizational structure, at some point one or more of these theories has crossed your mind. C'mon, you know it's true. Given a fixed amount of resources, no two projects can occupy the same space/time continuum and be successfully delivered on time. Personnel shortages, constantly changing objectives, scope creep and lack of focus contribute to this one. Those with the ideas need to be talking with those who execute. I think that's how Chrysler turned it around at one point. The best work is done is spite of management. An individual's personal desire to excel and succeed will outlast the policies and procedures that often are in place, and that seem to hinder progress and improvement. It's easier to ask forgiveness than permission. Sometimes, you just have to get it done. And when you do get it done, sometimes you'll get called on the carpet for doing so. Beg for mercy, then point out how it will benefit the project or company. If you were right, resist the urge to say "I told you so." Thank you, Grace Hopper. Disclaimer: Theories offered "as is." Use at your own risk. The use of protective eyewear, gloves and hazmats suits are highly recommended when appropriate. Do not point these sharp observations at your eyes. Your experience may differ, please use these theories with caution and discernment. Design Matters accepts no responsibility for any consequential actions associated with the implementation, repetition and or dissemination of these theories. It's Labor Day weekend, and the staff of designMatters isn't working too hard, and for the most part we're not thinking about work, business or design. So for a break from the race, may I recommend some light reading from... Dave Barry. As keen an observer as such luminaries as Seth Godin, Dave has been at The Miami Herald since 1983. He has won a Pulitzer Prize winner for commentary, and writes about issues ranging from the international economy to exploding toilets. Really. So put down that business book and lighten up this weekend, get your own Dave Barry book and have a good laugh. At someone else's expense, of course.